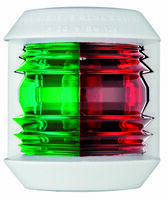 Sidelights are red (port) and green (starboard) and shine from dead ahead to 112.5° aft on either side. 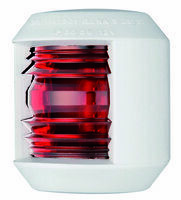 Masthead lights are white and shine from 112.5° on the port side through dead ahead to 112.5° on the starboard side. They must be above the sidelights. Sidelights may be combined into a single "bicolor" light. Powerboats less than 20m (65.7') in length need to show sidelights, a stern light and a masthead light. 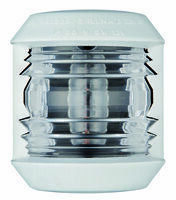 Power vessels less than 12m may show a single all-round light in lieu of the separate masthead and stern lights. Sailing vessels less than 20m in length need to show sidelights and a stern light. 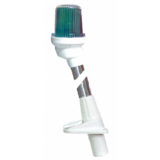 These may be combined into a bicolor light and stern light, or a single tricolor light at the top of the mast. Sailing vessels under 7m must have an electric torch or lantern available for collision avoidance. 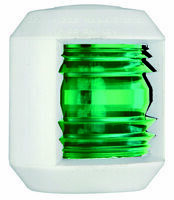 When anchored outside a special anchorage, power and sail vessels under 20m must display an all-round light. 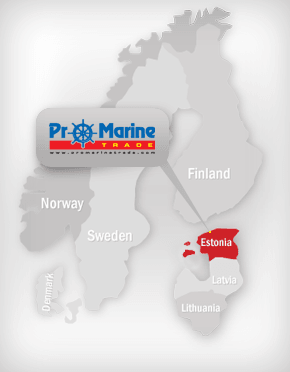 Vessels under 7m are exempt, unless anchored in a narrow channel or anchorage, or where other vessels usually navigate. Sail boats under sail under 65'7" can substitute a tri-color light for separate sidelights and stern light. The light bulb, that marvel of technology created by Thomas Edison, operates by cramming a large volume of electrical current through a resistor encapsulated in a vacuum. This resistor, the tungsten filament, gets so hot that it glows white, and only the absence of oxygen prevents it from burning up in an instant. About 5% of the energy is released as light. The rest is mostly turned into heat, as we all know from burning our fingertips when we try to change a 60-watt bulb. After more than a century, we’re still depending on Edison’s technology, but there are now cooler, more energy-efficient, and more “elegant” alternatives. In the very near future we’ll be seeing a lot more of them, mainly because they will reduce energy use and the production of greenhouse gasses. The Energy Independence and Security Act of 2007 requires roughly 25 percent greater efficiency for light bulbs, phased in from 2012 through 2014, beginning with the 100W bulb. This will effectively ban the sale of most current incandescent light bulbs. As of January 1st, 2011, standard 100W incandescent light bulbs have already been phased out of California stores. By 2020, bulbs must be 70 percent more efficient than they are today. LEDs’ light color emission is determined by the chemistry of the device. There are two primary varieties of LEDs. The first, blue, white, green and ultraviolet LEDs use indium gallium nitride (InGaN).